Do you have an action plan now that Google says HTTPS is a ranking signal? Are you eager for the next Penguin Update? Have you ingested the newest version of Google’s Quality Rating Guidelines and integrated them into your optimization approach? In this Hangout you’ll hear what we’re doing and recommending for our clients in light of the recent Google updates. 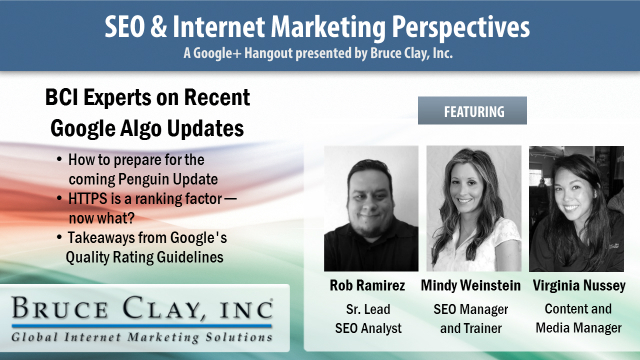 Our SEO manager, Mindy Weinstein, and our senior lead SEO analyst, Rob Ramirez, video chat about those three big changes to Google’s organic ranking algorithm and touch on takeaways from our reading of the 160-page Google Quality Rating Guidelines version 5. Listen to our conversation and read the highlights below. SEO industry insiders, has Panda, Penguin or HTTPS got you thinking about a new approach? A rankings shake-up in early August is suspected to have been caused by an adjustment to Google’s Panda algorithm (evaluation of content quality). Another theory is that the highly volatile Google rankings over the last week were due to the tweaking of multiple ranking signals at once ━ a multi-pack update, as it’s sometimes called. As Hangout moderator, I thought we’d break the ice with this subject. But to be honest, things got more interesting as we broached topics with more critical and unknown implications. Like … could a Penguin backlink refresh be a bad thing for a lot of websites? In a Google Webmaster Hangout, John Mueller confirmed that engineers are working on a Penguin refresh, and while some outcry from the community suggests SEOs are eager for the update, John explained it’s not as simple as flipping a switch. Rob said there’s speculation that recent fluctuations in SERPs could be Google live testing the effect of Penguin elements and looking at what those SERPs will look like in the wild if they were to flip those switches. Rob said he suspects the delay to refresh Penguin can probably be traced in part to the massive amount of data that’s been generated from disavow files. If Google wants to use that data, and presumably they do, there are so many domains that have been disavowed that it’s hard for Google to filter out the signal from the noise. Rob suspects that, from its tests to see what SERPs look like if they account for all the disavow data, Google doesn’t like what it sees. Read more about Rob’s criticism of Google’s Penguin refresh delay in Does Google Have a Responsibility to Refresh Its Penguin Algorithm? Mindy asserted that we don’t know what the next update is going to look like, and that it might actually make things harder for many businesses, rather than better. With each update Penguin gets a little stricter, and so while the SEO community anticipates the refresh, it’s an unknown that could be as much of a risk as a benefit. What’s our recommended action plan if a client is playing the waiting game against Penguin’s cold shoulder? Work on improving your site, your user experience. Engage in a campaign to build traffic and visibility, and while you may not see your efforts reflected in the rankings, work to make the site as strong as it can be so it’s ready when Penguin is refreshed. Prove your pages’ value and make your site more engaging and likely to convert visitors once Google recognizes your backlink clean-up effort. HTTPS is a confirmed ranking signal, albeit minor, as of August 7. Page encryption is not as highly valued as other signals, probably because it’s not an option that makes sense for every website. In our discussion, Rob described SSL certificates and encrypted connections as a best practice for sites that accept money and have a payment gateway. However, doing it across all pages is cost prohibitive, especially for sites with hundreds of thousands of pages and sites hosted in the cloud. There’s also the matter of implementing HTTPS properly; if you don’t redirect pages and define canonicals, you can end up with duplicate pages in Google’s index and an SEO clean-up hassle. Mindy recalled SMX Advanced in June, when Google explained its reasons for recommending encrypted and secure sites. Now, months later, Google has indicated that encryption is a minor ranking signal. Mindy said she considers this the beginning of an ongoing progression toward increased emphasis on site security by Google. Here’s another thing to consider about the implications of this new ranking signal. It puts businesses that can afford expensive SSL certificates at an advantage and may disadvantage smaller businesses that aren’t able to buy top-of-the-line certificates. But Google, Rob reminded us, wants to make sure their algorithm doesn’t punish local, mom-and-pop businesses that are focused on their goods, services and customers. A lot of those businesses aren’t going to change their sites so they’re fully encrypted ━ only a small percentage of websites even pay attention to SEO. Google has to balance that reality with its desire to support initiatives for online security via HTTPS as a ranking factor. One other consequence of a fully encrypted site that Rob mentioned is that it removes Google’s need to encrypt searches and thus filter keyword referral data, known as “Not Provided.” If Google is pointing to an encrypted page on an encrypted site from SERPs, the search engine doesn’t need to hide the referral data from prying eyes. Right now the decision to encrypt a site requires consideration of the cost and effort involved, and whether the benefit is worth that cost. If Google were to return keyword referral data for encrypted sites, Rob would certainly advise his clients to secure their sites. I’d scheduled our Hangout for 30 minutes and we had a few minutes to spare, so I asked Rob and Mindy what stood out to them in their reading of the May 2014 Google Quality Rating Guidelines that were leaked this summer. Mindy was struck by the fact that the guidelines instruct human raters to look off-site to get a sense of a site’s reputation. A brand’s or business’s reputation is an important consideration in Google’s rankings, and that means that rankings take into account realities apart from that brand’s carefully curated and owned presence, its website. Yes, to show you’re an expert, your website needs to align with your subject of expertise. But a true expert’s expertise is reflected in what others say about them. Mindy encouraged online businesses to consider the roots of marketing — getting your business in front of people and getting people to talk about your brand. The long and short of our chat on the latest Google updates is that there has never been a shortcut that works long-term, only actions which truly earn rankings. For businesses waiting for the Penguin algorithm to refresh, there’s work to do to improve the site so that when the refresh happens and rankings lift, your site is engaging, sticky and better at converting visitors. If you’re considering HTTPS for your site hoping to get a rankings boost, weigh this factor against the cost and effort of implementation and target areas or pages on your site for which extra security serves a purpose. And, finally, don’t overlook the value and trust signals conveyed by general “about” type pages on your site and your reputation as conveyed by what other sites say about you online. POLL: Does Google Have a Responsibility to Refresh Its Penguin Algorithm? If moving to https, is it sure that the page rank will be passed to new site sooner or laters or do i have to rebuild it again. Please advise. Nice summary on all the things that have been going on last month. Have been interesting times for all SEOs and active webmasters. Yeah, Google Penguin has definately been a long time overdue. Can’t wait to see what they came up with and what tweaks they added to the filter. Thanks again for the video and the writeup! @Christina that was really a good question to ask at the right moment!! HTTPS protocol, as a ranking factor, has been blown out of proportion. Though Google has said that it will gain more importance in times to come, I do not see that happening in near future. HTTPS has limited relevance. And, Google can not bend towards it too much. Content and UX will continue to be more significant than HTTPS. Penguin update makes all the internet marketers alert and try to find out what changes are done. Penguin update always been a major update for all Internet marketers. Its becoming late so its assuming that there will be something big and new this time. On the other hand HTTPS is also becoming one of the ranking factor but not at very large scale. But in the next some years it will also counted as an important part for increasing ranking factor. Virginia, That’s a great sum up. Regarding https some of my friends have done it and they have faced problems of losing traffic significantly. What could be the reason for that? Should they revert back to http? What do you think? Thanks Virginia :-) there is so much going on right now; appreciate your take on the latest news. My comment on the SSL is that what collusion is going on between Google and SSL providers?